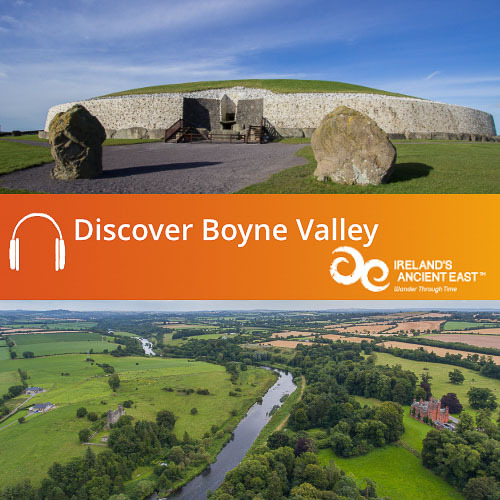 Our Boyne Valley Audio Guides lead you through the soul of Ireland’s Ancient East. Today this region is synonymous with the World Heritage Site of Newgrange and the tombs of the Brú na Bóinne. However, you can explore a wealth of heritage representing almost every period in Irish history. From the furthest reaches of our prehistoric past to ancient royal landscapes, through the dawn of Christianity in Ireland to great landed estates. The Boyne Valley truly is the perfect place to encounter the story of Ireland. ‘Among the many scenes of beauty and of interest with which this fair island abounds, we know of none which contains them in such variety as the Pleasant Boyne’. The ruins of the fifteenth century Ardmulchan Church stand on the south side of the River Boyne and overlook one of the most beautiful vistas of the landscape. With an almost bewildering array of monuments, the Hill of Tara is undoubtedly one of the most iconic archaeological landscapes in Ireland. Bective Abbey is a superb heritage site located in the valley of the River Boyne. It was founded in 1147 by the King of Meath and given to the Cistercian Order. Bective was a ‘daughter house’ of Mellifont, the first Cistercian foundation in Ireland. Just to the east of Athboy, you can find the mysterious site of Tlachtga (known as the Hill of Ward). The incredible passage-tomb cemetery of Loughcrew is located near the village of Oldcastle in County Meath. 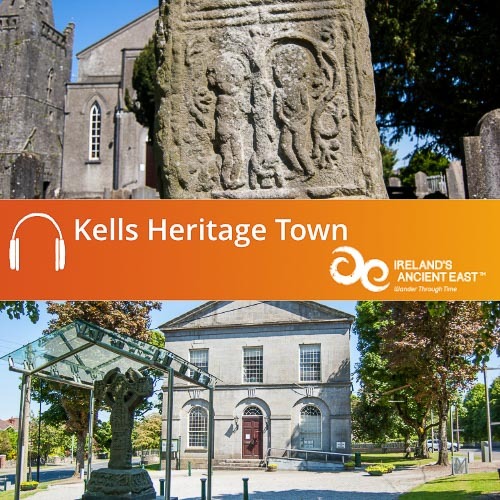 Kells has a treasure trove of superb heritage sites to discover. Legend has it that a monastery was founded at Donaghmore by St. Patrick who placed it in the care of his disciple St. Cassan. Here you can find one of the best-preserved round towers in Ireland. Perhaps most famous today for popular rock concerts, Slane Castle was originally the fortress of the Flemings. They were granted the lands in the wake of the Anglo-Norman conquest of Leinster. Like its near neighbour Tara, the Hill of Slane is also steeped in Irish myth, legend and history. According to Irish mythology, this was the burial place of Sláine mac Dela, king of the legendary Fir Bolg. It is from Dumha Sláine, meaning ‘burial mound of Sláine’ that we get the modern name, Slane. The museum is housed in the cottage where Francis Ledwidge was born in 1887 near Slane, the eighth of nine children of a poor family. He would become one of the most important Irish poets and left a legacy of poetry that speaks of his deep love of Ireland, Meath and the Boyne Valley. The entrance to the estate of Townley Hall lies close to a great curve in the River Boyne. A long wooded avenue leads to the handsome Georgian mansion, built in the late eighteenth century and designed by the celebrated Classical architect Francis Johnston. Mellifont Abbey was the first Cistercian abbey in Ireland, known as the ‘Mother House’, a base from which the community expanded, adding more and more institutions known as ‘daughter houses’ across Ireland. The name Mellifont comes from the Latin Fons Mellis, meaning ‘Fount of Honey’. A monastery was founded here by St Buithe in the sixth century and it is from this early saint that Monasterboice takes its name; Mainistir Bhúithe; meaning Buithe’s Monastery. The name Drogheda comes from the Irish, Droichead Átha, meaning ‘The bridge of the Ford’. The town was founded in the late twelfth century by the Norman Lord of Meath, Hugh de Lacy. Situated near the mouth of the River Boyne, Drogheda was perfectly placed to become one of Ireland’s most important ports during the medieval period, and the town grew wealthy through trade right across Europe. The handsome Beaulieu House dates back to the late seventeenth century. Beaulieu House was turned into the house we see today by the Tichbournes in the mid 17th and early 18th Century and has remained largely unchanged since. 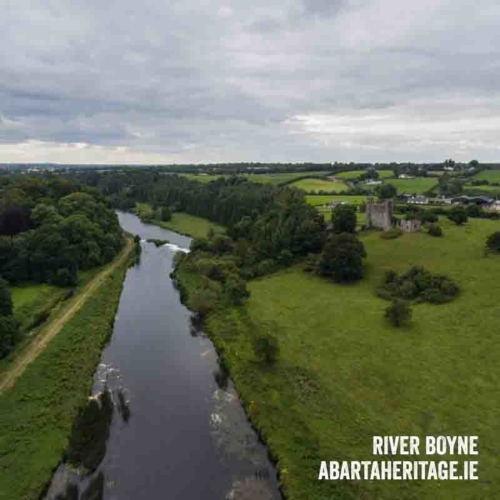 The Boyne Valley was the setting of some of the key events of the later medieval and post-medieval periods in Irish history, the most famous being the Battle of the Boyne, the story of which is told in the modern Battle of the Boyne Visitor Centre at Oldbridge. Duleek was originally founded by St. Cianan sometime before 489 AD, who is said to have built the first stone church here in Ireland. We produced this audio guide on behalf Meath Tourism and Meath County Council. We are also grateful for the kind support of Louth County Council and the Office of Public Works.